As one door opens, another one closes. So while you're celebrating the return of Wolverine to the pages of Marvel Comics, it's time to prepare for "The Death of Daredevil." Marvel announced Daredevil writer Charles Soule will wrap up his run on the title with a storyline that could bring the death of Matt Murdock to fruition. Soule will be joined by artist Phil Noto for the end of his run with a four issue arc beginning in Daredevil #609. Soule spoke with Marvel.com to announce the series, revealing that he's taking part in the time-honored tradition of ruining Murdock's life as much as possible to leave a big mess for the next writer to clean up. “A lot of writers in the past have left Daredevil in terrible situations at the end of their runs,” Soule said. “Brian Michael Bendis put him in prison for Ed Brubaker to handle; Mark Waid, who preceded me, had Daredevil in San Francisco, his secret identity was blown, he wasn’t a lawyer anymore. I had to handle all of that. The arc will come out bi-weekly, with the first issue being released on October 17th. It will all wrap up in issue #612, hitting store shelves on November 28. October is shaping up to be a big month for the Devil of Hell's Kitchen, and Marvel Comics looks to be capitalizing off of the buzz. Daredevil the series returns to Netflix for Season 3 on October 19th, just two days after "The Death of Daredevil" launches. 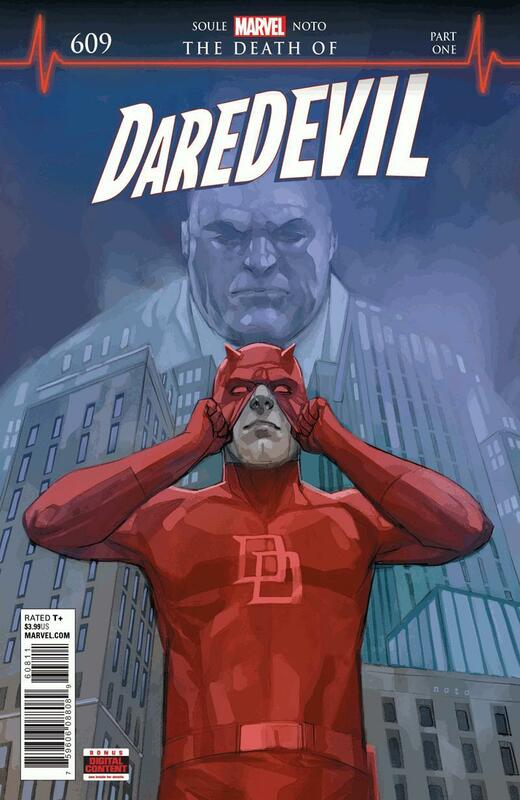 It looks like the Kingpin will play a major role in the storyline, much like he will in the upcoming season of the show, as the character looms large on the cover of Daredevil #609. It remains to be seen what Marvel Comics has planned for the future of the character, especially with the Netflix series likely to stir up interest from lapsed and new fans alike. But based on Soule's comments, a new creative team is probably on deck, waiting to fix Matt Murdock's life before ruining it all over again. "The Death of Daredevil" begins with Daredevil #609, in comics stores on Wednesday, October 17th.